Fascism has many faces. One of these, condemned by the politically active Hadjidakis, launched a personal attack on him towards the end of the ‘80s. But let’s start from the beginning. Domestic immigrants attained premature power and wealth. And we’re victims of their tastes and the implications thereof, he writes in 1982. A year later he suggests that a more anticultural socialism than ours is nowhere to be found. It’s the outcome of a materialist bliss that the Right had achieved in its own time. He could well have been accused of bourgeois aloofness. But other acts of his showed that class distinction was not his motive. In 1983, he welcomes a concert given by Dionysis Savopoulos at the Olympic Stadium with the hope that it would mark the beginning of youth’s deliverance from party politics, enabling them to see for themselves those persons capable of offering them sincere emotion and food for thought. That same year he gives concerts at the Avgi Festival [left wing] and the ONNED Festival [Young Conservatives Organization]. The former rouses enthusiasm in him; but he is obliged to interrupt the latter after twenty minutes, walking out in protest of the young audience’s behaviour. That, according to Stelios Ramfos, exactly what person like Manos should do. But what really makes Hadjidakis furious is the phenomenon Avriani, which he denounces in a most impressive and courageous way on 7th September,1987, before an unsuspecting audience of several thousands, who came to hear him and Nana Mouskouri perform at the Panathenian Stadium. He spoke of that rag that contaminates the nation with its cheek, vulgarity, thuggery, and cajoles of our fellow-citizens…that flatters itself into believing, like Karaghiozis, that it was responsible for Karamanlis’ downfall, whereas the only thing it managed to do is to destroy human dignity…that professes protecting democracy, the rodent that it is; that gains profit from ignorance and trivialities. And he ended by saying: Avriani should cease publication. And this is the purpose of my appearance in the stadium tonight. 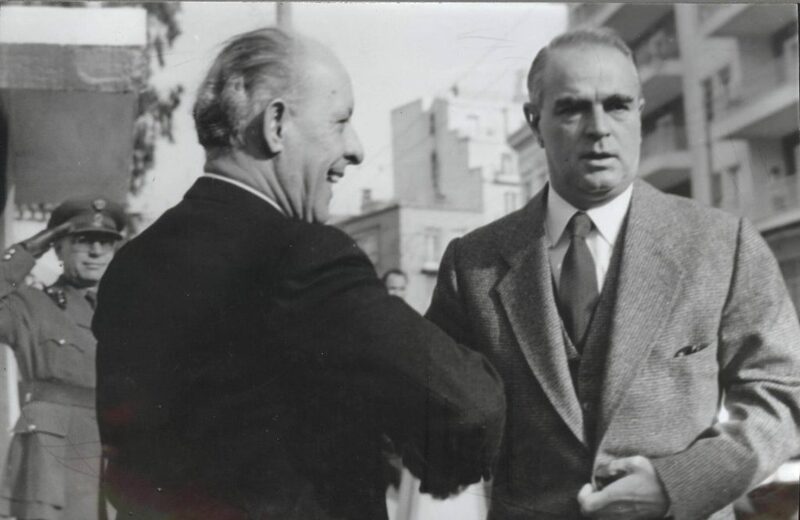 Next day, Avriani, and in due time Eleftheri Ora, launched a relentless war against Hadjidakis, reminding him of the photograph with Makarezos and, more prominently, making a scurrilous attack on his sexual preferences. “He doesn’t like the wholesome populace because he prefers…fruit,” is one of the mildest titles of Avriani. It also invites anyone who had an affair with him at some time or another to write or phone giving their “experiences, enabling us to complete our extensive research into his nibs.” In 1988, the composer forbids the broadcasting of his music from the radio stations owned by the Kouris brothers. I won’t allow these fascists to claim that they are fulfilling a “cultural service” with my work. The Koskotas scandal, with whose magazine, Tetarto, he had already severed his relations, makes him feel vindicated. In 1991, he refers to a sordid society. What is he implying? Damn it, you only have to look at what politically represents current society, to realize that it exists and functions without a trace of sensitivity, without a care in the world. You think all these scandals took place without people’s knowledge? And where does he politically and aesthetically place his hopes, seeing that he considers everything as interlinked? On the unknown public, the unknown young people who possess sensitivity and haven’t yet been undermined. Now to what extent the powers that be will allow them to preserve their sensitivity is another matter.